Almost every morning, I stop at the Dunkin' Donuts Express in Back Bay Station as I transfer between the Commuter Rail and the Orange Line. I only go two stops, which is just enough time to finish my iced coffee and get to studio at least partially awake. The reason I don't stop into that Dunkin' on some mornings is because of one thing: the sign in the main concourse telling me that I have 2...1...minutes before my train arrives. But more often than not, I emerge from the Commuter Rail platform, take a quick glance at the sign, and see that I have at least 4 minutes, which I - and many other passengers - have learned is just enough time to get my coffee and still make the train. One morning when I had a few extra minutes, I noticed a plaque behind the cashier awarded to this particular Dunkin' for having the greatest increase in customers in its district in 2013. It took only moment to connect the dots: real-time data about train arrivals had been introduced at Back Bay in late 2012. Over the next year, this Dunkin' had seen a marked increase in its customers despite having no street frontage, being tucked away in Back Bay's rather dingy concourse, and the fact that no new buildings or transit services had been introduced near there in 2012 or 2013. The increase, therefore, was simply because commuters, like myself, now knew exactly how long they had before the next train arrived and could decide to grab a coffee before heading down to the platform. When real-time data was first being implemented in T stations, a favorite phrase thrown around by the T and its advocates was that people "would know if they had time to grab a coffee". Based on the plaque at Dunkin' Donuts Express, it seems that they were absolutely right. This is data and its implementation having a direct, positive economic impact on the city, and the trickle down impacts are probably even greater than the increased sales at this Dunkin' location. In the past year, a juice bar and Tasty Burger have opened up in Back Bay Station, and I'm sure that being able to point to how well Dunkin' is doing helped convince these companies to move in. This is just a small - but very clear - sign of how implementing data can significantly improve the urban experience. As Boston teams up with companies like Uber and Google to access their datasets and employ them in tangible ways, the foundations of an interactive, 21st-century city will be built. It is up to us as citizens and critical thinkers to capitalize on these tools, consider their successes and failures, and appreciate that we live in a better city because of them. A recent proposal to squeeze an infill development into the courtyard of the 500 Boylston tower has received praise from urbanists and architects who argue that Boylston Street needs enhanced street life, denser development, and greater activation. Generally, these tenets hold true on most streets in most cities, and while one of the lessons of Boston’s dalliance with Modernist urbanism in the mid 20th-century was that we should keep our streetwalls tight and our neighborhoods dense, infill for the sake of infill is a precept that we have a responsibility to question. While CBT’s proposed design for the infill project is not a bad one, 500 Boylston’s courtyard is not a space we can afford to lose to a glass box, however engaging its undulations and renderings may be. I have written previously that as an architecture, 500 Boylston is more than meets the eye. Rather than simply being another Postmodernist (PoMo in the parlance of the moment) office tower, Philip Johnson and John Burgee’s 1987 project for Hines Interests is actually one of Boston’s and Postmodernism’s greatest architectural lessons, and as such, is worthy of preservation in its current form. The proposed infill development by CBT Architects, from the PNF filed with the Boston Redevelopment Authority. bit of history: I have argued in the post linked above that Johnson/Burgee - but likely Johnson in particular - were using 500 Boylston as a way to show Boston and the world that pushing Postmodernism to its logical extreme is not the way for architecture to be moving. The building is therefore both the style perfected and a scathing indictment of it. At the time of its conception, Bostonians had fallen in love with Postmodernism’s faux-classical approach to architecture, which involved slathering buildings in every bit of ornamentation possible as a rebuff to the austere severity of Modernism, and PoMo towers were popping up all over the city. Johnson, one of the greatest Modernists of his day, embraced PoMo’s oft-garish expressionism but ultimately returned to the purer forms of Modernism in his later work. Nevertheless, Boston wanted PoMo, and the BRA was pushing the development of towers along Boylston Street as part of its High Spine masterplan. 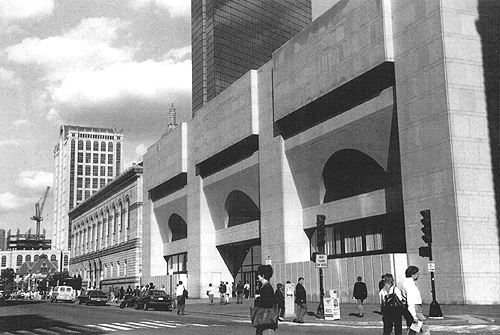 Unsurprisingly, the development of 500 Boylston was still fraught with controversy. Neighbors and neighborhood associations battled Johnson/Burgee and the original developers resulting in the elimination of a few floors (sound familiar?) and giving the tower its rather squat proportions. The tower was ultimately built and dressed to the nines with every ornament Johnson/Burgee could throw at it, and when finished Bostonians decided they hated it. What was supposed to be an identical tower next door was scrapped because of community opposition to the tower’s squatness and an apparent realization that Postmodernism at its most Postmodernist extreme was actually something quite distasteful. Robert A. M. Stern was brought in to complete the second tower in a quieter, less opinionated fashion, and one can only assume that Johnson felt some vindication that Bostonians, it seemed, had learned their architectural lesson of the ‘80’s. 500 Boylston seen from within the courtyard, its Palladian window form and courtyard ornamentation are highlighted. 500 Boylston is a building we should respect not only because through its sagacious teachings it is a perfect architectural lesson, but also because it presents us with some very unique design. As the ultimate PoMo building, the tower’s form is taken explicitly from the Palladian window, itself a classically ornamented fenestration designed by original “starchitect”, 16th-century Venetian architect Andrea Palladio. But the real brilliance comes in the courtyard, the main part of the building currently threatened. Here, Johnson/Burgee’s ornamentation really comes to life at the human scale. Columns and arches fly overhead to aggrandize the main entrance. Pilasters, quoins, and balustrades break down the tower’s massing into architectural symbols that speak “power, strength, wealth, stability” causing almost every tourist or first-time passerby to stop and take a photo of a building that imparts a sense of timelessness despite being only 28. What is it about the courtyard at 500 Boylston that feels so familiar? It is oddly enchanting and inviting even if frequently unpleasantly windy. The je-ne-sais-quoi of this place is that we have all seen it before, either in picture or in person. It is a miniature, abstracted, replica of one of the most famous squares in the world: St. Peter’s. Yes, The Vatican comes to Boston at 500 Boylston. The curving arms of the tower’s podium mirror Bernini’s massive colonnades, the triptych form of the tower’s main entrance mimics the massing of St. Peter’s Basilica, and the proportional placement of the courtyard’s twin fountains is all but identical to those at St. Peter’s. It’s true, the famous obelisk is absent, but is replaced by a small obelisk in each fountain. This is not simply some slap-shod windswept plaza, this is the culmination of an entire architectural style. Whether or not we agree with the conceptual foundations of Postmodernism, learning to recognize, accept, and respect its perfection is part of becoming the cultured, creative, global city that all Bostonians aspire to. The references to St. Peter's Square (right) are particularly evident when seen from above. There will, inevitably, be backlash to my argument that 500 Boylston’s courtyard is a unique space worth saving, so let me take a few moments to respond preemptively. First, to Equity Office Properties 500 Boylston’s current owner and would-be developer of the infill project, I understand that Boston’s current economic and development climate makes this opportunity hard to pass up, so let me offer an alternative. When Robert A. M. Stern was brought in to design the neighboring tower, 222 Berkeley, he liked the idea that both towers should have some sort of open space and so built an atrium of about the same size as 500 Boylston’s courtyard in the interstitial building. The atrium is essentially impossible for the public to access because of 222 Berkeley’s security, is massively underused even by the tower’s office workers who find it cavernous and banal, and would not be terribly desirable even if it were more accessible. Infill there. Yes, it would be more expensive to build into it than it would be to fill 500 Boylston’s courtyard, but you would preserve a space that will someday be seen as a crucial moment in American architectural history. Robert A. M. Stern's 222 Berkeley is seen at right in this drawing. Its atrium is under the curved glass between 500 Boylston and 222 Berkeley. To my fellow architects, urbanists, and spatial thinkers who argue that Boylston Street needs the activation that would come with this infill project: you are right – sort of. To be honest, Boylston Street is in good shape as far as activation goes; you might consider focusing your advocacy elsewhere like Dudley Street in Roxbury or Blue Hill Ave in Mattapan. Nevertheless, to replace the atrium at 222 Berkeley, Equity could place a retractable glass dome over Boston’s miniature St. Peter’s square and enclose its front with glass and doors without demolishing any of the existing details or destroying the building’s massing. The result would be a publically accessible year-round space protected from the bothersome wind, not unlike Don Chiofaro’s Aquarium Garage tower proposal. This enhanced courtyard could host more retail and dining options, and rethinking the way that the current retailers use the existing window bays could provide a more diverse interaction with the street. (Do Talbot’s and Marshall’s really need to use every window bay both inside and outside the courtyard? I don’t think so). Ask yourselves, is infill for the sake of infill always the answer? Should we scour the city filling every courtyard and gap we can find? There goes the BPL’s courtyard, the windy, Brutalist Christian Science Reflecting Pool, and how about that silly Paul Revere Mall leading up to Old North Church? What a waste of space right on Hanover Street! Certainly, some of these spaced could be filled without any great loss, but 500 Boylston’s courtyard is not one of them. Finally, to future architecture students, historians, and Bostonians writ large: if my advocacy results in the change of course I hope for, you’re welcome. Here in 2015 Postmodernism is just beginning to have its moment, reflected by the fact that I can say PoMo somewhat un-ironically, and that the work of architects like Michael Graves is finally getting the recognition it deserves. When you read this and Postmodernism has found its place in the pantheon of interesting if imperfect architectural styles like Modernism and Brutalism, please take a moment to go look at 500 Boylston and consider that it is the entirety of a style synthesized and perfected into one building. If I fail, and 500 Boylston’s courtyard is destroyed, the building made impotent, and the cause of preserving Postmodernism’s worthwhile artifacts irreparably damaged, forgive me. Forgive all of 2015’s Bostonians; Government Center, Central Artery, 500 Boylston – it seems that even when the master presents the perfect lesson, we cannot learn. Truly, we know not what we do. This post originally appeared on BostInno.com. Perhaps as a result of a long winter that’s still hanging on for dear life in Boston, I’ve had warm places on my mind recently. A phone call with a cousin who lives in LA prompted me to try to put into writing something I’ve been thinking about ever since my visit there two (warm, warm) summers ago. I recalled that as I planned my trip I would ask friends I was hoping to see where in LA where they lived, and their responses invariably came in relation to highways: “West of the 405, north of the 10”, “In the Valley, just off the 5”. I would usually have to ask "which Valley?" because LA has many and I quickly learned that “the Valley” means different things depending on where you live. When I finally got to LA it felt like I was in an episode of “The Californians”, Saturday Night Live’s parody soap opera about Angelinos who speak only in terms of major roads and highways. As I explored LA (I was determined to use only public transportation as a test of its efficacy), something bugged me about the way my friends and Angelinos writ large were speaking, and I slowly realized it was because of their use of one of English’s simplest words: the. That was it, they used “the” strangely. Never in my life had I heard people put our only definite article before a highway number, but they did it incessantly, not even questioning that one cannot have “the 405” because what is "a 405" anyway? I wondered what were the special conditions that could cause the city-state of LA County to collectively - and seemingly unwittingly - decide to speak this way and what does this say about the way they perceive and interact with their space. Morning rush hour on "the 5" (Author's collection). Angelino’s use of “the” has aggrandized highways into geography. Because of the way these megastructures dominate the city’s landscape and facilitate a complete ignorance of any existing natural geography they have become the only meaningful demarcation of space in LA. LA’s auto-centric culture means that for millions of Angelinos, highways are the only type of geography they interact with on a daily basis. Whereas other cities might define neighborhoods or regions by rivers, hills, or parks, when I asked if “East LA” meant east of the LA River, the most common response I received was “where’s the river?” Responses from more astute observers of the built landscape were varied. Depending on where they lived, East LA could mean east of the 405, east of Downtown, or east of the “insert-north-south-highway-number-here”. Even though the LA River effectively separates Downtown from everything east of it and “the 710” follows the River for much of its course, not once did someone say “east of the river”. Imagine if to define Cambridge from Boston one said “north of Storrow Drive” instead of “across the Charles” or to distinguish Manhattan from Brooklyn we said “on the other side of FDR Drive”. Even in places where roads are used as defining boundaries, “the” is rarely used. For example, Detroit is not defined as within “the 8 Mile”. There are some crucial exceptions: when speaking about a highway as a noun, “the turnpike”, “the Beltway”, “le Peripherique”, our definite article is requisite because there is no other way to know which turnpike or because “inside Beltway” is terrbile grammar. In Boston one might say “take the Pike to 128”, but never “take the 90 to the 128” because frankly, you would sound stupid. Paris’s Peripherique is an extra special case, though. A bounding highway built over the original city walls, it borrows its modern role as a definer of space from its predecessor, and even today is seen as a great divide between wealthy, museum-esque inner Paris and its poorer, economically depressed suburbs, though efforts are in place to change this as part of the massive Grand Paris masterplan and a comprehensive approach to creating an inclusive transportation system. Another important half-exception is one that I hinted at above. The one type of geography that Angelinos do seem to recognize, or at least reference, is “the Valley”. However, the idea of “the Valley” as a depression between two mountainous areas separated from another area is completely lost because highways make traveling through complicated terrain so easy and the confusion as to exactly which valley is the Valley suggest that Angelinos aren’t even sure what “the Valley” is or means. To most, the Valley is the San Fernando Valley, home of movie stars, mansions, and film studios, but in East LA (wherever that is), “the Valley” refers to the San Gabriel Valley named for the San Gabriel Mountains to the north and the San Gabriel River that flows through it. Even before the current drought, however, the river was little more than a linear patch of mud that few would have noticed while soaring over it on the 10 or alongside it on the 605. Every Angelino knows where the 110 is, but few could define the boundaries of “the Valley”. So irrelevant are the natural, geographic defining lines of human space to Angelinos that armed with their “the’s” and highway numbers, they are frequently unaware of where the City of Los Angeles ends and another city like Manhattan Beach begins. When asked in my very informal survey, few could definitively decided whether or not Manhattan Beach was the same legal jurisdiction as Los Angeles. Urban sprawl has led to a complete erasure of even those boundaries set forth by man in policy and law books. All that remains as recognizable demarcation are the 8-, 12-, 16-, 20-lane car-rivers that fly like aqueducts 60, 80, 100, 120 feet in the air, causing tears in the urban fabric, shifts in street grids, and fluctuations in neighborhood economies that most elsewhere only geography has the power to do. The way that highways disassociate us from the standard human scales of time and space is a well-documented phenomenon, but in Los Angeles we see what happens when highways are the only scale of time and space. The City, the County, the entire region in effect becomes tabula rasa regardless of existing built form under the crushing power of soaring highway pylons and massive cloverleaves. Los Angeles is the only place in the world, that I know of, where the labeling phenomenon of “the” has taken hold so firmly that where denizens of other cities might say “the mountains” or “the river”, Angelinos will say “the 110” and “the 405”. As our power to influence the built landscape at a massive scale increases, we must seriously question whether this lesson from LA shows that geography is replaceable if not replicable, and if so, what are the long-term consequences for a society that chooses this route? How can you know how much water is in the river if you don't even know where the river is? Few architects can claim to have two major projects in Boston’s exclusive Back Bay, fewer still on its grand thoroughfare of towers and luxury hotels, Boylston Street, and only one enjoys the prestige of two projects in Boston’s most renowned public space, Copley Square. One of the most influential and controversial architects of the 20th century, Philip Johnson is the holder of this noble title, in addition to a Pritzker Prize and an AIA Gold Medal. His two Copley Square projects – the Johnson Building of the Boston Public Library and the office tower, 500 Boylston – while less than two blocks apart could not be more distant conceptually and ideologically. The BPL’s Johnson Building, while not terribly loved by Bostonians, is a culminating example of this prolific architect’s early work. Its severe and austere massing, harsh poured-concrete, stark though dazzling atrium, and vast, open floor plans display Johnson’s absolute mastery of minimalist modernism and his ability to make brutalism a comfortable and even respectful style. In extraordinarily stark contrast, Johnson’s 500 Boylston office tower designed in partnership with John Burgee is an effulgence of postmodernist ornamental expression, whose Palladian window form (and façade) and miniature St. Peter’s Square are so ostentatiously classical mimicry that closer inspection reveals the entire building to be Johnson’s critique of postmodernism as a whole. The main facade of 500 Boylston, displaying both the Palladian-form and detailed ornamentation. Johnson’s collaboration with John Burgee, which started in 1968 and ended on bad terms in 1991, was by far the most prolific time for both architects. In 1984 they produced the highly controversial former AT&T World Headquarters in Manhattan that was, in most ways, a fairly straightforward modernist skyscraper apart from the glaring addition of a roofline designed to look like a massive pediment. This neoclassical cake-topper heralded in Johnson/Burgee’s explicit interest in postmodernism, yet the AT&T building does not ignore Johnson’s purely modernist roots. Only three years later the cake-topper consumed the entirety of the cake. When Johnson/Burgee produced 500 Boylston, rather than simply employing a classical element as adornment they used a Palladian window as the basis of the tower’s form. The tower is further cloaked in balustrades, pilasters, arches, quoins, columns, coffers, and nearly every other classical decoration imaginable. The design shows no restraint; in direct opposition to Johnson’s building at the BPL it is a heavy-handed investigation of “going too far”. 500 Boylston's plaza is a miniature abstraction of St. Peter's Square at the Vatican: oval in plan, enclosed by columned arches, with symmetrical fountains, each featuring an obelisk of sorts. It is entirely possible that what at first appears to be a stylistic dalliance is actually an architecture lesson dressed in classical clothing. Johnson is trying to explore and indict what happens when one pushes post-modernism to its logical extreme. With the simplicity of modernism as Johnson’s conceptual and stylistic foundation, the dogmatic ornamentation of 500 Boylston is almost too textbook to be taken seriously. With this building, Johnson is teaching the architecture world that postmodernism at its peak is something garish and devoid of any real significance or meaningfulness. The building was intended to have an identical counterpart next door: two massive Palladian windows onto the architectural soul of Boston. However, once the first tower was completed citizens, architects, planners, and preservationists all hated it and halted the construction of the second. Even architecturally self-righteous and oft-parochial Boston could not stand to see its opinions scrutinized under Johnson’s towering lens. Instead, Robert A. M. Stern was brought in to complete the neighboring tower as a quieter, less opinionated building. Elevation of Robert A. M. Stern's replacement (right) for the second tower at 500 Boylston. It is hard not to imagine Johnson finding some sense of vindication in this. He succeeded in creating a building so meticulously true to what was called for that even its proponents were forced to sheepishly admit that they had done wrong and learned their lesson. This brilliantly subversive act took down post-modernism simply by perfecting it. 500 Boylston, therefore, is a building that speaks not to the heyday of postmodernist expression, but rather to Johnson’s illimitable talent as an architect capable of mastering all styles, even those with which he disagreed, and bringing critical thought and valuable questions and lessons to every project he approached. The Johnson Building of the Boston Public Library with 500 Boylston in the far background. About a week ago I was fortunate enough to have a map of Rome’s transit system that I created be presented from Boston’s Mayor Walsh to Rome’s Mayor Marino. Later that day Mayor Marino gave a lecture on Rome’s transportation concerns at the Boston Society of Architects where I met him and spoke with some of his aides, all of whom expressed that their main focus in Rome is on modernizing both the city’s built form and image. This, of course, is no small task in one of the world’s great ancient cities where nearly all of the desirable land is built upon, and most of it is home to structures and spaces that carry a landmark status for a variety of reasons. Mayor Walsh presenting Mayor Marino with the map I designed as a gift from Boston to Rome. It’s an interesting problem to contemplate in the context of Rome, Boston, or really any city with an architectural legacy older than three generations or so – say 90 years (I would worry about modern contextuality in Tel Aviv, but not in most of Dubai). Keeping in mind the role that design plays in how people perceive a city’s image, how can we design buildings and spaces that successfully feel modern and forward-looking, while at the same time are respectful of the landmark status of their surroundings without bordering on mimicry? There are a variety of noteworthy approaches, Postmodernism itself likely having been the most sweeping; indeed, it was a trend whose grasp Boston is still struggling to escape. With its massive Palladian window form, columns, tiling, arcades, and ornaments, Philip Johnson's 500 Boylston is a good example of the post-modernism legacy left in Boston. While talking to Mayor Marino’s aides, I said, “What if we did a beautiful modern information pavilion in the piazza between the Coliseum and the entrance to the Forum?” The combined gasp of shock and expression of exhausted defeatism that I received in response said it all: “Been there, tried that”, “I wish”, and “Insantity! But just maybe…” Such was the reaction from a forward thinking, 20-something year old tasked directly from the Mayor with modernizing Rome’s own image of itself – I could only imagine what the general populace would think. In Rome two main methods have or are currently being tested to combat the fact that “brilliant modern architecture” is not the first or even third thing that comes to mind when discussing the city. The first is along the lines of Paris’s La Defense model whereby modern structures are built far away from the city center (called Centro Historico in Rome’s case) and are clustered together in a campus to avoid interaction or disruption of the Ancient, Classical, Medieval, and Renaissance structures in the more densely populated and visited parts of the city. This has come in two forms: the construction of the EUR campus far to the south of the Campo Marzo (the part of the city that most people think of as downtown Rome), which Mussolini built in a high fascist modernist style to host the 1942 World’s Fair, and the much more recent construction of a modern arts district to the north of the Campo in the Flaminio neighborhood where Santiago Calatrava designed a bridge, Zaha Hadid did the MAXXI, Renzo Piano designed the Parco della Musica, and a variety of ‘60’s sports structures remain from the Olympics. The EUR Campus south of Rome. At the center-bottom is the Palazzo della Civilità Italiana, the complex's architectural centerpiece. The approach being undertaken more recently has erred on the side of integration rather than the distant separation and observation achieved by far-flung campuses full of contemporary buildings. In the Testaccio and Ostiense neighborhoods, a short subway ride to the south of the Campo and within walking distance of many famous monuments, the city government is attempting to bring vitality to abandoned military and industrial facilities now surrounded by 19th- and early 20th-century apartment buildings. In Testaccio, the Museo d’Arte Contemporanea di Roma (MACRO) was opened in 2003 as a renovation of a massive slaughterhouse within walking distance of such monuments as the Pyramid of Cestius and the Circus Maximus. Two subway stops to the south, the city is building its new offices not far from the Basilica of Saint Paul Outside the Walls, thereby freeing up the space they currently occupy in Michelangelo’s Campidoglio to be used as a museum and simultaneously bringing new life to Ostiense. A four-story bamboo tower was constructed as part of an exhibit at the MACRO last year in Rome's Testaccio neighborhood. A similar approach has been undertaken in Boston by the city government, which has put a massive investment into the Dudley Square neighborhood in Roxbury through the renovation and expansion of the Ferdinand Department Store into the Dudley Square Municipal Building which will be home to the headquarters of the offices of the Boston Public Schools. The project hopes to enliven the area by providing new retail opportunities, office space, and a significantly larger working population. A rendering of what the Ferdinand Building will look like once its transformation into the Dudley Square Municipal Building is complete. Impressive as the endeavors here discussed by both Boston and Rome have been, they are primarily urban tactics to the integration of modern buildings and focus on the introduction of these buildings as a means to improving economic vitality in struggling areas. But what about architecturally? What is required of architectural design to allow the respectful introduction of a new building into a city’s already-vibrant, historical center? In Boston, the approach has become tired and sad; new buildings are clad in a patchwork of stone, glass, and brick as an attempt to both fit in and win the approval they need just to get built. The city’s largest firms reuse and tweak their tried-and-true designs and concepts because the review commissions have become accustomed to them and complacent to pass buildings through approval with as little community opposition as possible thereby squashing any possibility for newer, more innovative designers with significantly fresher and better designs to offer proposals. What proposals they do offer inevitably end up shirked off into the “thoughtleader” (read: “nice idea”) category. Architectural homogeneity in the form of hermetically-sealed stone and glass boxes runs rampant in Boston's Innovation and Seaport Districts. A few firms have championed what I call the “scoop-and-plop” method, whereby the facades of buildings originally on the site are left intact and a new tower is introduced behind them so that, at least at the street-level, there is no tremendous change and the urban fabric is largely preserved. More thoughtfully, Henry Cobb’s 1976 Hancock Place tower in Copley Square is both very respectful and very modern and has achieved a landmark status of its own. By using highly reflective glass and coyly angling itself away from Copley Square and its many great architectural landmarks, the tower actually enhances them and the square through an added sense of placehood, intentionality, and a visually pleasing, well-proportioned contrast. The Hancock Tower does its best to take a respectful backseat role to the architectural icons in Copley Square. But a project as masterful in its ability to tread all the right lines is rare, even nearly 38 years after the Hancock’s completion. Boston, like Rome, must rethink its priorities; do we want to be a city that prizes blending in over moving forward? Do we want to be the pretty city, the brilliant city, or the beauty-and-brains city? Smart design is beautiful design and as designers we are challenged and tasked to bring together these goals harmoniously. Cities too afraid to bring fresh, new ideas into their centers through architecture will find themselves going the way of Paris: a giant urban museum and playground of consumption for the super-rich.